He's as good as gone if you ask me. He's been a favorite of Carr, but the team can do better with the savings. Definitely not a must cut, but I thought Hankins was a better player and he's also younger. Adds nothing of value to the team. Team's best receiver from a year ago. Team's best nose tackle and arguably most consistent interior defensive lineman from a year ago. Still runs young. He's a good back with tread left. Played well when called upon. Quality depth. A reliable 3rd down target for Carr who can make a play here and there. Arguably the team's best safety from last year. Might be wise to lock him up for even longer than this deal. Not someone I want starting but he's good for the price. Not a lock to make the team, but he played admirably for an undrafted free agent. Cabinda was a better linebacker than Ateman was a receiver. He can play every position Guenther asks from his ends. Immediately steps in as the team's best pass rusher. All around receiver who can stretch the field, play slot, and catch underneath. Not too old veteran who is coming off a very good season playing a similar role Guenther asks his corners to play. Not a lock to make the team, but the upside is tremendous. Can play at end and inside. High quality depth. Provides veteran competition and depth at both tackle spots. I've written about him enough in the draft thread. He'll primarily play from the 5 out and bump inside on 3rd and longs with Key, Hurst, and Smith on the field. He's quickly becoming a draft crush for me. Toward the end of last season the Raiders played a heavy amount of 3-safety looks with Gilchrist playing a lot in the box. Abram is cut from a similar cloth as Derwin James and can do a lot of similar things as him if Guenther is willing to get creative. Abram also provides assurance for when Joseph likely departs after next season. Abram can also play weakside backer. Samuel is a well oiled offensive weapon who can do multiple things on offense and special teams. His versatility is just an addition to his refined receiving skills. He reminds me a lot of Jarvis Landry. The Raiders need to generate more big plays on offense and Henderson is a big play waiting to happen. The team will have to feel comfortable with the misdemeanor arrests while at Tennessee, but Williams is within the ballpark of just about any receiver in this class when it comes to talent. Jackson looks the part more than plays the part. For a 4th rounder, I think he fits the bill of a moldable block of clay. Love the idea of Smith - Hankins - Hurst - Gary line with Hall and Key rotating in. Extra love getting Carr a big WR, and resigning Cook. IMO if Baker is there at 24 you HAVE to take him plus i am Not a Kareem Jackson fan, so would rather see us spend that 7.5 and the 6 from Parker and use it to sign Landon Collins. And draft Bush at 27 because that is the weakest LB corps in the NFL by a country mile. And assuming he doesn't get picked at 33 or 34 you gotta take Harry at 35. Also... what happened to Jordy in your offseason? Great effort man! Really detailed with that full first rounder! Marcell and Cabinda are only ERFA guys, the RFA guys should get their 2019 tenders and that's it IMO. Maybe Richard could worth an extension, but I think his agent would recommend him to play on the tender and ask for a bigger deal or head for FA after another year. Where is Jordy Nelson? Can't see him in the "cut" department, can't see him in the roster neither. Since he already got some of his '19 salary in advance, I expect him to be on roster come September. Smith and Gary would be a pretty strong DE duo in the base, but I can't really see the danger as a pass rush combo in them. Smith is not a speed rusher and Gary also projects more as a speed to power guy, then a speed guy. We need speed at DE IMO, but could work this way too I guess. The Abraham, Samuel and Henderson picks are not too strong IMO, all seems like a reach to me right now, but I have to admit I don't know a lot about Henderson and I know close to nothing about Abraham. If you would have put Adderley and Harmon/Harry I would probably say nice job, so it is more prospect knowledge issue on my part. 5'9 200 RB in the 2nd is just too rich for me. Use Richard more as a runner, since he is already here with those measures and speed. LB position is untouched which is a concern to me with this scenario. Overall our front 7 still looks weak to me. I pretty much agree about Baker--in fact, I'm good with picking him at 4 that's so much I like him. But I wanted to try to mix things up here. Also, I don't think the league, as a whole, likes Baker as much as I do. Kareem Jackson played well as a zone corner last year for Houston. Ultimately, I would also like to use some early draft capital on a corner even if the team signs a starting caliber veteran like Jackson. The logic behind the Abrams pick is that he addresses both a present need and a future need at linebacker and safety, respectively. To me, there's not a whole lot separating Abrams and Derwin James as prospects, and for all intents and purposes, James played linebacker for the Chargers last year. I think Harry would be a strong candidate to get drafted by the Cardinals at the top of round 2. Even if he were on the board, I probably would take Henderson. A lack of an explosive element hamstrung the Raiders offense last year. Henderson might be the most explosive offensive player in this year's draft. I honestly forgot about Jordy, he's in there. I'd prefer Flowers over Sharpe from what I've seen of Sharpe and both would be had at their respective minimums. I haven't observed one snap of Flowers this year, but he apparently played okay on the left side for Jacksonville according to his PFF grade. 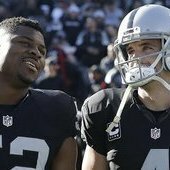 I disagree that between Smith and Gary the Raiders wouldn't at least have an above average pass rushing duo. Also, I don't think a pure speed guy is necessary to produce a good pass rush. Gary has an underrated speed element that shows up when he lines up wide. And like I wrote, he could bump inside on long 3rd downs with Key rushing outside him. I would watch both Abram and Henderson if I were you. Abram, to me, is nearly a carbon copy of Derwin James. Toward the end of last season, Guenther played a lot of 3 safeties with Gilchrist in the box. I think Abram can excel playing a similar role and weakside linebacker if Guenther really wants to get creative. Comparing him to Adderley, I think Abrams is better for what the Raiders can use him for. Henderson is the most explosive player I've watched this draft season so far. He reminds me of Chris Johnson with better contact balance (and probably less top-end speed). Samuel is a guy I've liked since I started watching players this offseason. To me, he's a faster version of Jarvis Landry and I could see him becoming an instant favorite of Carr before long. I have him ahead of both Harry and Harmon. Harmon I'm not a fan of before round 3--and even then I like guys like Preston Williams and Anthony Johnson over him. Huge fan of Henderson. His vision is stellar. I would take him over just about every other RB in this draft. My only concern is the level of competition he played against. Only other comment is that I'm not a fan of Gary at 4. I really hope we trade our 4th overall pick for a truckload of picks and then draft BPA all 3 days. I just want an influx of young talent and potential. I would be happy if we traded back to around 13 and picked up Devin White and 2-3 more picks while the Dolphins guarenteed their chances of getting the QB they want. I'm in the same boat. If Bosa and Allen are off the board, which they should be, please trade down. There are at least 6 pass rushers that we could pick up later in the first round and I don't think any of them deserve to go at #4. Don't want to be mean, but I stopped reading after this. RFA contracts are all 1 year deals and typically 2 million is the highest you'll ever see. 1 year, 1.5 mill would be more accurate and Worley's deal is the most realistic. As for Ateman, we signed him to a 4 year deal last year, not sure why he is a FA at all. If anything he is ERFA, as is Cabinda. If Devin white falls that far, I would hope we explore trading up for him. pretty solid ideas, only real problem id have with this is again well have diddley at lb. imo LBer must be addressed id say terrill hanks/coney/pratt in the 3rd. then Isabella and doss later if possible. but that's it great mock bro. the only other change I might think about is adderly for abram. Right about the 1 year deals. But 1st round tender on RFA was a little over $4mil last year I believe. Around $3m for 2nd round. So can expect a slight increase this year most likely. And Ateman should be an ERFA along with Cabinda. His 4 year deal was from being drafted. But voided when he was cut and sent to the PS. 1 year deal when he was signed to the active roster. Replace mike davis with doug martin and ill be happy. Also hard pass on flowers hes terrible. I can't see putting a 2nd round tender on any of these guys, definitely not a 1st.